When you think of Discover, you probably think about credit cards. But they’re also a bank and now offer checking and savings accounts to customers nationwide. Recently, I applied for their savings account in order to snag a $100 opening bonus. All you have to do for that is deposit $10,000. Alternatively, you can deposit $5,000 and get a $50 bonus. Either way, they offer a solid APY (0.95%) compared to most other large banks. I had money in ING Direct (which became Capital One 360) but the APY kept ticking lower until settling in around 0.75%. Boo! I figured it made sense to get that extra .20% and $100 for filling out a short application. The link I used to get the $100 Discover savings account bonus was not my own – I found it at Hustler Money Blog. And the terms of the deal actually mention his blog so I figured it was legit. He has a promo code (S00000EEL) but notes that it automatically populates when you use his link. After applying, simply call Discover or send them a secure message to ensure you’re set to get the bonus. For this particular offer, the $10,000/$5,000 deposit must be received by 11/15/2015 and the bonus will be issued by 12/31/15. 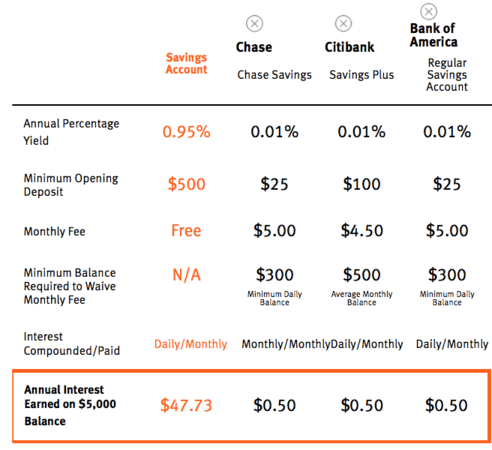 Another cool aspect of this offer is the fact that there’s no minimum needed in your savings account, unlike other bank accounts such as Chase. There are also no fees of any kind, another huge plus. However, you do have to deposit a minimum of $500 to open a Discover savings account. Update: My opening deposit was made on October 8th and the $100 bonus was credited to my account on November 4th. Here’s where it gets even better. Once you’ve got your Discover savings account, you can snag another $300 if you open a Discover Cashback Checking account. Again, there are no fees on this puppy, which is awesome, and you get access to 60,000 free ATM machines nationwide at places like 7-11, Walgreens, and CVS. You can also deposit checks on your phone and you earn 10 cents for each purchase made with your Discover debit card (assuming you request one). You also earn 10 cents for each bill paid using their online bill payment service, and 10 cents for checks you write that clear your account. There’s a limit of 100 cash back transactions per month, or $10. More importantly, you can earn $300 for opening a new Discover Cashback Checking account. This one is a tad trickier than the savings account bonus but still super easy to complete. All you have to do is apply via this link (not my link but had the offer details) and enter promo code “Bonus4915” in the box provided on the application. After you submit you application, you simply need to make an opening deposit of at least $25 and complete two direct deposits of at least $250 each within 90 days. The $300 bonus will be deposited in your account within 30 days of completing those basic requirements. It’s that easy folks! How else can you earn $400 so quickly and easily? For the record, it’s really simple to fill out the forms online if you’re already a Discover credit card holder. You can use your existing information and same login to pre-populate many fields. And once you open one of the accounts it’s really convenient to open the other. I opened the savings account first then transferred money from it to my new Discover checking account. But you can do it the other way around too. The only downside to this deal is that the “income” you receive is taxable, unlike credit card rewards. But it’s still $400 before taxes and one of the highest savings account rates you’ll find. And a truly free checking account! That’s hard to beat. Read more: Earn 23% cash back with Discover and ApplePay!